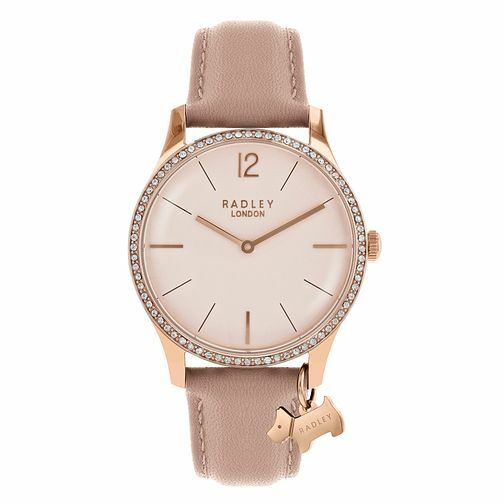 The classic shape of this ladies' leather watch will add a sophisticated touch to your wardrobe, whilst the Radley dog rose gold tone charm and matching case adds an element of fun to your look. Opt for wearing timeless hues with this subtle pink leather design. The stone set bezel adds an element of glamour to this stunningly sophisticated watch. Radley Ladies' Pink Leather Strap Watch is rated 5.0 out of 5 by 1. Rated 5 out of 5 by Anonymous from Present for my wife I bought this as a present for my wife for our anniversary and she loved it.